All home need a little touch-up every once in a while, especially in a place with a seasonal climate like Pasadena, Maryland. We all love the sea air and the gentle ocean breeze, but the salt vapor in the air wreaks havoc on paint and wooden construction over time – and many homeowners in Maryland find themselves forced to repaint their homes every five to ten years. Luckily, a little bit of foresight and planning can save you the hassle of constantly having to repaint your home’s exterior – and a small investment in higher quality paint will pay off in spades down the road. Your Pasadena exterior painters have helped hundreds of Maryland homeowners with their exterior painting, using the latest in technology and materials to apply long-lasting paint to homes of all kinds. With our Pasadena house painting business, you’ll learn to appreciate house painting for the chance to reinvent your style rather than dreading painting as a chore that must be approached with dread. 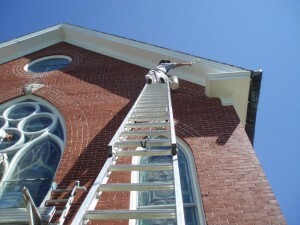 All Painting and Power Washing is the #1 exterior painting service in the Pasadena MD area. Even though you might think of painters as being single-minded in their approach to a job – coming to your house and applying a coat of paint before heading on their way – the reality is much different. Painting is a very complex task, especially for the irregular surface on the outside of your home. If you were to just slap a coat of paint on your house without any prep work, the paint would rapidly age and start to peel – and it wouldn’t “stick” to your home very well. You can spot the houses where homeowners tried to cut corners in their exterior paint jobs by the houses that have paint already flaking off the walls and siding. The first step of exterior painting is a complete cleaning of your home. Luckily, our Pasadena painting service has a complete full-service pressure washing service attached, and we can do high and low pressure washing of your home to makes sure that the walls are completely clean before we start further surface preparation. After cleaning your home, we will go through the exterior surfaces to ensure that old coats of paints are smoothed – with bulges and bubbles in the paint removed where necessary. This is an important step because these are areas where the new paint would not adhere well and you would start to see peeling first. Next, we go through the exterior of your house to create a perfect surface that is ready to accept paint. Often, especially on older homes, this means doing a little bit of repair work on the surface itself. Where necessary, we will replace rotten and damaged wood or siding boards – and we do all the scraping and sanding that is necessary to produce the absolute best possible canvas for your exterior painting job. Even though we use premium paint and the best primers in the industry, your paint job is only as good as the structural integrity of the surface underneath – but we can help you restore your home to its original glory before painting it with the color of your choice. You can’t simply expect to paint the outside of your house with the same tools that you would use for interior painting. Interior painting is actually relatively easy compared to exterior painting, and a roller and a couple of brushes is all you need to paint the large surfaces inside your home. On the outside of your home – all the siding, the corners, and the accent pieces pose a unique challenge for your painting team. It takes hours and hours for painters to complete the outside of your home – making it a poor choice for a DIY project. If you don’t finish your painting job before weather hits, it can ruin your results and force you to do a very expensive repaint job. Professional painters are skilled at negotiating the weather – and they finish each stage of the project when the humidity is low and the temperature is perfect for the paint to dry and set. Our painters get your job completed on time, with no overruns in materials or overtime. They are professional, efficient, and they will help you through every stage of your painting needs so you’ll end up with a beautiful home in a minimum amount of time. You can do a lot of things to make your home look better from the street. You can add landscaping features, you can replace your driveway, you can even build a garage or erect a fence. Nothing will have as much impact, though, as a simple coat of paint. Exterior paint is vital to the appearance of your home, and it is much cheaper (and more cost effective) to change than the other features of your house. Better still, if you get tired of your exterior paint scheme after a couple years, you can easily swap the colors out for another set – just repaint! Painting is also a great way to protect the investment that you’ve made in your home – since the paint directly protects your home from damage by the elements and by insects. Don’t let “budget” painters fool you – exterior painting isn’t something that should be done on the cheap. Exterior painting is expensive enough that you don’t want to be constantly redoing your paint job, yet that’s exactly what you will end up doing if you go with one of the cheap independent painters that use dodgy materials and questionable paints. As the leading painter in the area, we use the best quality paint to make sure that your exterior paint job lasts forever. We don’t believe that you should ever take shortcuts with something as important as your property value, and we give you an investment-grade paint job that will add to your home’s value and your peace of mind. Fill out the form below or just call us at 443-790-7145 for a FREE Estimate on your Pasadena MD exterior painting project. A member of our All Painting and Power Washing staff will get back to you straight away.